Completed in 1851, Historic Playmakers Theatre was intended to serve as a combination library and ballroom. 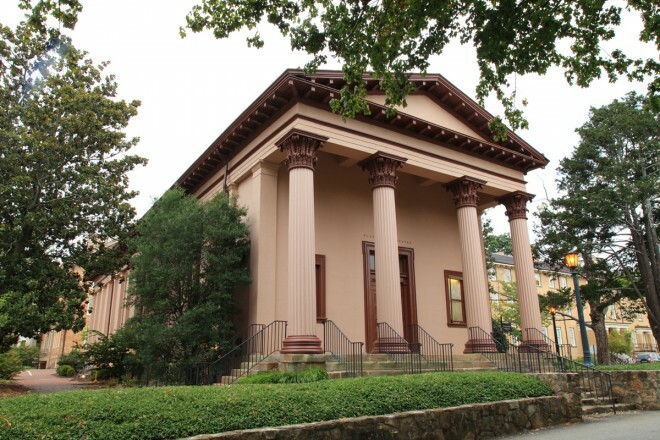 The Greek Revival building was originally called Smith Hall in honor of Benjamin Smith, special aide to George Washington during the Revolutionary War and a former Governor of North Carolina. Smith donated land to the University, which was sold to finance construction. Since then, Historic Playmakers Theatre has, at one time or another, hosted the Universitys Law School; performers including Carolina alumni Thomas Wolfe and Andy Griffith; and according to legend, Union cavalry horses who may have been stabled here in the latter weeks of the Civil War. Historic Playmakers Theatre is a National Historic Landmark and the oldest building on campus dedicated to the arts. Visitors will notice a modification to the Corinthian capitals on the buildings portico made by architect Alexander Jackson Davis, who substituted North Carolinian staple crops wheat and corn in lieu of the traditional acanthus leaves. The theatre lay dormant for four years awaiting much needed repairs. It reopened for events beginning in November 2010 after an interior upgrade funded by the Office of the Provost and the Office of the Executive Director for the Arts. As part of the upgrade, the interior of the building was painted, the auditorium floor refinished and new audience seats, curtains and stage lighting and sound systems were installed. The building seats approximately 240 and is well-suited for performances and lectures. The interior upgrade was sufficient to make the building ready for use again, though the improvements are short of a full renovation. Currently, the stage and backstage facilities are not accessible to persons in wheelchairs or with mobility issues. There is no air conditioning, dressing rooms or restrooms in the facility (restrooms in nearby buildings are available for use). Historic Playmakers Theatre is located on East Cameron Avenue next to South Building and across the street from Old East.